Description [https://ci.jenkins.io/job/Tools/job/maven-hpi-plugin/view/change-requests/job/PR-53/] was build by a PR (mine) but on the job page there is no information about the job. 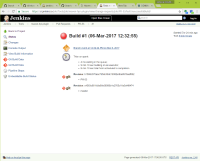 If you follow the permalink (which takes you to build#1) then you can see the build exists and did indeed fail... [https://ci.jenkins.io/job/Tools/job/maven-hpi-plugin/view/change-requests/job/PR-53/] was build by a PR (mine) but on the job page there is no information about the job. No idea offhand. Build failure is not indicative of any deep problem in Jenkins, just a hung Docker daemon. Jesse Glick added a comment - 2017-03-06 18:11 No idea offhand. Build failure is not indicative of any deep problem in Jenkins, just a hung Docker daemon. Jesse Glick Its not the failure of the build that this bug is for - it is the lack of the build being shown when it is quite clearly exists. but could not reproduce it—the next time I started the container, all was fine. I have not yet figured out what could cause this. Something has to be deeply wrong for this to happen—for example, two Job’s with the same name. I have a suspicion that something in the SCM API 2.x changes caused this. Stephen Connolly any clues? Jesse Glick added a comment - 2017-03-06 23:26 I saw this get thrown from workflow-aggregator-plugin/demo … jenkins.model.lazy.LazyBuildMixIn newBuild WARNING: A new build could not be created in job cd/master java.lang.IllegalStateException: JENKINS-23152: /var/jenkins_home/jobs/cd/branches/master/builds/1 already existed; will not overwrite with cd/master #1 at hudson.model.RunMap.put(RunMap.java:188) at jenkins.model.lazy.LazyBuildMixIn.newBuild(LazyBuildMixIn.java:185) at org.jenkinsci.plugins.workflow.job.WorkflowJob.createExecutable(WorkflowJob.java:260) at hudson.model.Executor$1.call(Executor.java:355) at hudson.model.Executor$1.call(Executor.java:337) at hudson.model.Queue._withLock(Queue.java:1368) at hudson.model.Queue.withLock(Queue.java:1229) at hudson.model.Executor.run(Executor.java:337) but could not reproduce it—the next time I started the container, all was fine. I have not yet figured out what could cause this. Something has to be deeply wrong for this to happen—for example, two Job ’s with the same name. I have a suspicion that something in the SCM API 2.x changes caused this. Stephen Connolly any clues? Happens sporadically, but often enough to do diagnosis I think. Jesse Glick added a comment - 2017-03-06 23:38 Happens sporadically, but often enough to do diagnosis I think. I wonder could it be concurrent branch indexing with event processing? Stephen Connolly added a comment - 2017-03-07 09:31 I wonder could it be concurrent branch indexing with event processing? could it be concurrent branch indexing with event processing? Did you manage to pinpoint the problem? From looking at logs it seems like PeriodicFolderTrigger fires and then the indexing runs twice in a row but with identical (down to ms) start timestamp. Furthermore the code in SCMHeadObserverImpl.observe seems to be faulty somehow—it has already called observer.shouldUpdate, so it should know there is an existing project, yet it is still getting down to the _factory.newInstance call. Or is it the shouldUpdate implementation which is wrong? Jesse Glick added a comment - 2017-03-07 14:52 could it be concurrent branch indexing with event processing? Did you manage to pinpoint the problem? From looking at logs it seems like PeriodicFolderTrigger fires and then the indexing runs twice in a row but with identical (down to ms) start timestamp. Furthermore the code in SCMHeadObserverImpl.observe seems to be faulty somehow—it has already called observer.shouldUpdate , so it should know there is an existing project, yet it is still getting down to the _factory.newInstance call. Or is it the shouldUpdate implementation which is wrong? FTR shouldUpdate was the problem here. Jesse Glick added a comment - 2017-03-07 16:21 FTR shouldUpdate was the problem here. JENKINS-42511 FolderCron can run PeriodicFolderTrigger multiple times in quick succession, so do not rely solely on FolderComputation.timestamp. SCM/JIRA link daemon added a comment - 2017-03-08 09:58 Code changed in jenkins User: Jesse Glick Path: src/main/java/com/cloudbees/hudson/plugins/folder/computed/ComputedFolder.java src/main/java/com/cloudbees/hudson/plugins/folder/computed/PeriodicFolderTrigger.java http://jenkins-ci.org/commit/cloudbees-folder-plugin/4bc16d7552d6473ea1e86813564ba055860e2437 Log: JENKINS-42511 FolderCron can run PeriodicFolderTrigger multiple times in quick succession, so do not rely solely on FolderComputation.timestamp. JENKINS-42511 Make sure we do not attempt to create the same branch project twice. SCM/JIRA link daemon added a comment - 2017-03-08 11:26 Code changed in jenkins User: Jesse Glick Path: src/main/java/jenkins/branch/MultiBranchProject.java http://jenkins-ci.org/commit/branch-api-plugin/61a48b16f22690256701354e661675e56b8d4b38 Log: JENKINS-42511 Make sure we do not attempt to create the same branch project twice.